I bought a flat iron steak for the first time a month ago and didn’t really know what to make with it. I went through my stack of recipes, you know the stack that consists of pages ripped out of magazines just waiting to be used! I found an old copy of the All You magazine and there was this recipe. It used flank steak, but I thought I could easily substitute the flat iron steak I had since I heard it takes well to marinades…and I was right! It was really good and the marinade wasn’t too strong and gave the meat a nice subtle flavor. Combine the vinegar, sugar, rosemary and salt in a ziplock bag. Add steak to bag, seal and turn bag several times to coat the meat with the marinade. Refrigerate for 20 minutes, turning once or twice to redistribute the marinade. Preheat a gas grill to high. Remove steak from marinade and sprinkle both sides with salt and pepper. Discard leftover marinade. 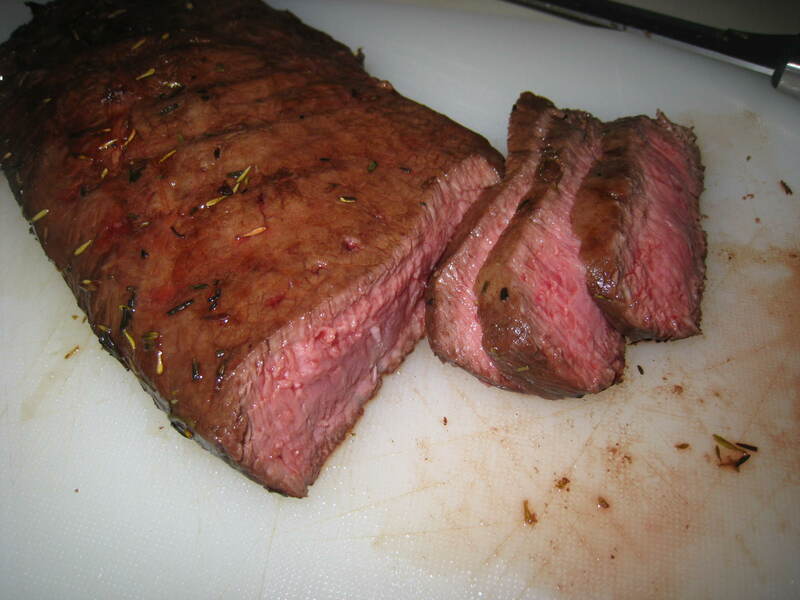 Grill steak for 4 to 6 minutes, carefully turn over and continue to grill until meat reaches your desired doneness. Transfer steak to a cutting board, tent loosely with foil and let stand 5 minutes. Slice steak thinly against th grain. Alternatively you can cook the steak on a lightly oiled ridged grill pan over medium-high heat on a stove for the same amount of time.